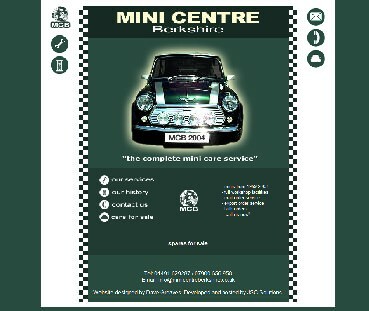 Mini Centre Berkshire is a small family run automotive business that specialises in Minis. Basically "Anything Mini" goes - meaning they will repair and service, buy and sell, renovate and even bring a car up to racing specification. Work was currently expanding, and the business expected to move from the family home, to a small garage unit. Mini Centre Berkshire approached JSC Solutions Ltd to develop and host a new website that would promote their services online, with the view to further expanding their customer base. The creative requirements were for the web site to be simple, bright and arresting. JSC Solutions retained the services of a trusted solutions partner well-versed in new media skills to ensure the web site had a professional, "pixel-tight", visual presentation. The initial invitation to quote for the work arrived in mid October 2003. The requirements capture, proposal, design and development and finally publishing of the finished work was complete well before Christmas. This niche, family-run, business was already trading successfully on eBay but wanted to make their proposition a little more personal with their own web site. What the owners wanted was an online store where they could could showcase their catalogue of original handcrafted fleecewear and sell items online. They also wanted to be able to manage their own stock and make their own updates to the web site. For this web build, the WordPress CMS was chosen as the underlying framework. 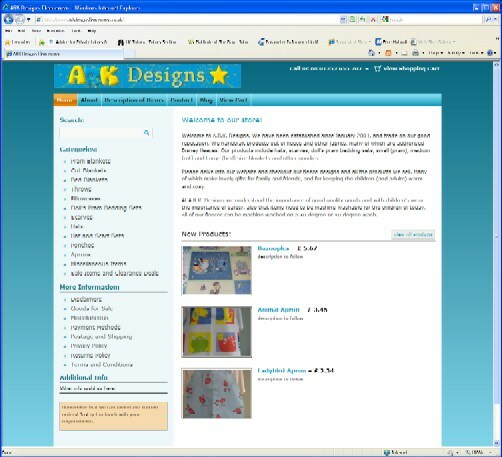 It was stylised and given ecommerce features by use of a specialised theme. With administrative access to the backend of the web site, the proprietors can write their own news items, update and add pages, update pictures and details for their products and of course add new ones. The ecommerce is integrated with PayPal to accept payments securely online.